This is .30 Carbine Speer Gold Dot 110gr. Gold Dot Soft Point Ammo. Speer Gold Dot Rifle ammunition gives law enforcement agencies superb performance, accuracy, and reliability in their duty rifles. Speer's exclusive Uni-Cor jacket bonding technology virtually eliminates core/jacket separations. 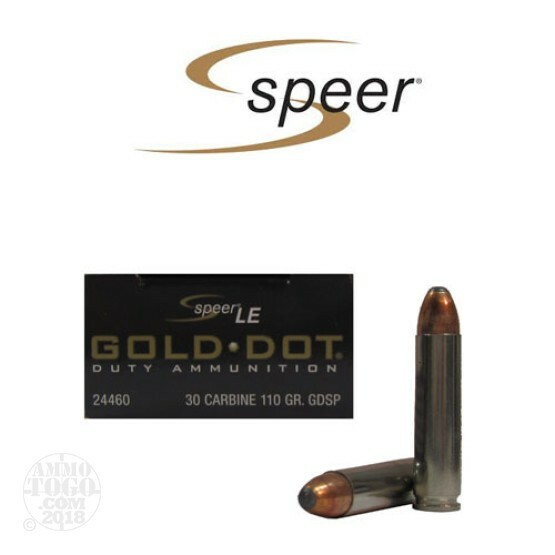 Like its handgun counterpart, Speer Gold Dot Rifle ammunition is designed for optimum expansion and penetration to meet the strict standards for Law Enforcement ammunition. This ammo is nickel coated brass cased, boxer primed, and 100% non-corrosive. This ammo comes packed in 20rd. boxes.